To clarify, V8 came in its original formulation. However, over the years, the brand has grown and now offers more variety. 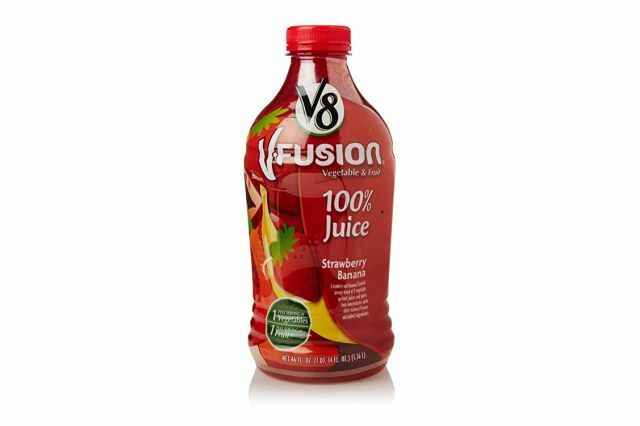 V8 fusion is one of the variations of the vegetable juice. V8 is the original product. It is a vegetable juice that’s primarily made with tomatoes. Hence the red tomato color. However, Campbell, which is the parent company that makes V8, found that not everyone likes the taste of tomatoes. So, they’ve formulated other flavors. Among these are V8 Splash and V8 Fusion, which combine fruit juices along with the vegetables. This not only offers consumers different taste other than tomato but also a variety of flavors. 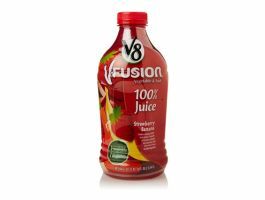 As far as V8 fusion goes, flavors include grape raspberry, cherry apple, pineapple strawberry and tropic orange to name a few. Before getting into V8 Fusion, we explain what’s in V8 vegetable juice. After all, this is the base product that started it all. V8 juice is one of the oldest brands of juice in the market. It was invented in the year 1933 in Illinois. V8 juice still contains the same 8 vegetables as it did back then. These vegetables are celery, carrots, lettuce, parsley, watercress, tomatoes, spinach, and beets. Since 1933, however, the company has developed more than 20 active variants of the juice. These include those geared towards health, including the low sodium mixture, fruit mixtures as well as with extra added vegetables. But the real question is are these juices good for your health? According to a recent survey which was conducted, only 13 percent of the Americans adults meet the required vegetable intake. This increases the need of using an additional supplement. Doing so can help us take a step forward in fulfilling this deficiency as far as getting our required vegetables in. If we look at V8, you’ll quickly notice that it contains a number of nutrients that can bridge this deficiency gap. The original V8 juice contains about 51 calories for every serving. Along with the small amount of calories, there are about 2 grams of protein, 10 grams of carbohydrates, and 8 grams of sugar. Plus you get around 2 grams of fiber. Each serving also supplies you with 4 percent of the daily dose of required calcium, 4 percent of daily recommended dosage of iron, with 23 percent of our required daily potassium intake. All in all, this is a quick and easy way to get our veggies along with extra nutrients in. Do keep in mind, that the juice does contain 8 grams of sugar, which is a substantial amount. Along with the sugar content concern, it’s also worth looking at the drink’s sodium levels. 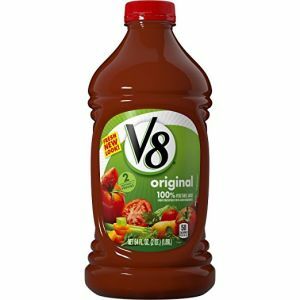 While the Original V8 juice is also very good in vitamin A and C, each 8 oz. serving has 640 mg of sodium. That’s huge! At 640 mg in an 8 oz. glass, you’re already getting 27% of your daily sodium. All in one drink. Not really a good idea, considering that high blood pressure is now a big concern that’s hitting even teenagers. The low sodium variant of the juice is a much better option. Along with the 50 calories in each 8 oz. serving, you get 140 mg of sodium. That makes it more bearable, and not too far off from other similar health drinks. It’s also only 6% of our daily sodium limit, so you’re not too bad. The low sodium version also actually contains more potassium then the original V8. It has 900 mg of potassium, which is 26% of our daily required intake. Whereas, the original V8 has 460 mg, which is roughly half of that. 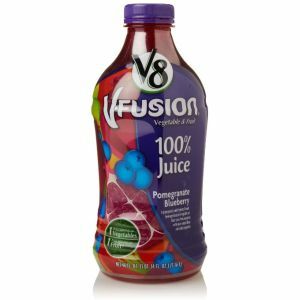 V8 Fusion, as mentioned earlier, has fruit incorporated into the vegetable juice. Essentially, it uses 1 full serving of fruit to 1 full serving of vegetables. This V8 variant comes in a wide variety of flavors with strawberry banana, peach mango and pomegranate blueberry being among the most popular flavors. V8 Fusion includes various types of vegetables including carrots, tomatoes, beets and sweet potatoes. Plus, the fruit portions depending on the flavor your get. Essentially, the manufacturer says that it contains no added sugars, as well as no artificial colors, flavors or preservatives. Additionally, it is a good source of Vitamins A, C and E. V8 Fusion also contains a good amount of antioxidants to boost your immune system. As far are nutrition data does, each 8 oz. cup serving has double the calories of the original V8, at 110 calories. The good news is that it has a low amount of sodium at 70 mg.
Other than that though, everything goes considerable down from there. At least compared to the original V8 and V8 low sodium. You get much less potassium in V8 Fusion at 340 mg. There’s no fiber and no protein. Plus, the sugar is sky high at 22 grams per serving. That’s nearly the sugar limit per day recommended by the World Health Organization (WHO), which is 25 mg daily. And that’s just in one cup. While it may taste better than the V8 vegetable juice and its low sodium option, we recommend passing on this one. There are better options to get your vitamins. What is Better Juice or Whole Vegetables? Many doctors recommend that you should not get your required vegetables from juices. Instead, they recommend that we eat whole vegetable. The reason is that the whole vegetables contain a lot more fiber then juices. Additionally, you get them in their natural form. There’s no processing or addition of additives, sugars, and other ingredients. Having said that, in today’s busy lifestyle V8 juice can provide you many necessary ingredients to ensure that the gap of deficiencies are reduced. This is especially true when it comes to getting our veggies in. But as we’ve seen above, this does not comes without any cost. There have been reports suggesting that one possible health concern with V8 juice is that it can initiate loose stool. This is not very likely in the juices which contains pure veggies. But, those ones which have a mixture of veggies and fruit juices can give your these issues. The sugar in fruit juice, when mixed with veggies can cause loose stool or diarrhea if consumed in large proportions and in absence of any solid foods. According to the nutrition information provided by the manufacturer, the V8 juice there has no added sugar in the juices. However, the juices still contain a higher proportion of natural sugar. This is not the case with juices which are 100% vegetable made, but the blends contain a sugar on higher proportions. By far, the biggest concern with V8 Fusion is its sugar content. At around 22 to 23 grams per 8 oz. serving. That’s a lot. 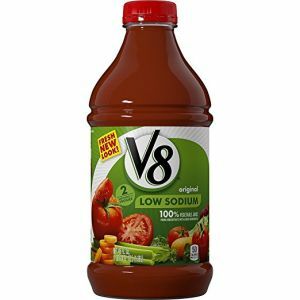 You’re better off with the original V8 Vegetable Juice, or the V8 Low Sodium option, which contain 7 grams and 6 grams of sugar, respectively. In today’s hectic lifestyle where more and more people are suffering from some kind of deficiencies, V8 juices offer a lot of benefits. They can be very effective in bridging the gap when it comes to our nutrient deficiency as far as vegetables go. But, at the same time, if you have choice and time to go for the natural and fresh alternative, then you can be protected from the health concerns these juices comes with. Out of all the variants, all the V8 Vegetable options are still the best alternatives with minimal health problems. We recommend skipping the V8 Fusion despite being more pleasant to the palate.